Furthermore, as a seasoned marketing services company of over 25 years we know online and print advertising have to work harder. The reason is the prospect isn’t necessarily looking for what you have to sell. Consequently, to draw their attention you need great, interruptive creative and an airtight media plan. As Rovi’s print advertising agency we tackled this assignment by creating an ad that captures an unexpected moment. As a result, we used a bride who is distracted from her wedding vows. Nearby an ad from the Rovi Ad Network scrolling on a nearby TV. 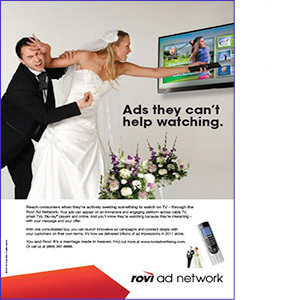 This ad won a SAM (Subscriber Ad Measurement) Award, granted to Rovi by Advertising Age. It scored among the top 10 ads in its Q3 measurement study for total recall score of 71%, based on a survey of 300 readers.